Irving Penn was a Vogue photographer for over sixty years, and during that time has taken countless iconic fashion images. It’s pointless to list the famous names he has made portraits of because there are just so many over that half-decade – I would venture to say hundreds. He also pioneered a certain kind of instantly recognisable and much copied portraiture. His signature style is black and white studio photography, with a plain grey background and strong, dramatic lighting. Irving Penn also created still life, travel, documentary and sociological photographs and painted, too. He was famously married to the beautiful model Lisa Fonnsagrives-Penn, and his fashion photographs of her are some of the most breathtaking of his career. Lisa Fonssagrives by Irving Penn. Image via Pinterest. 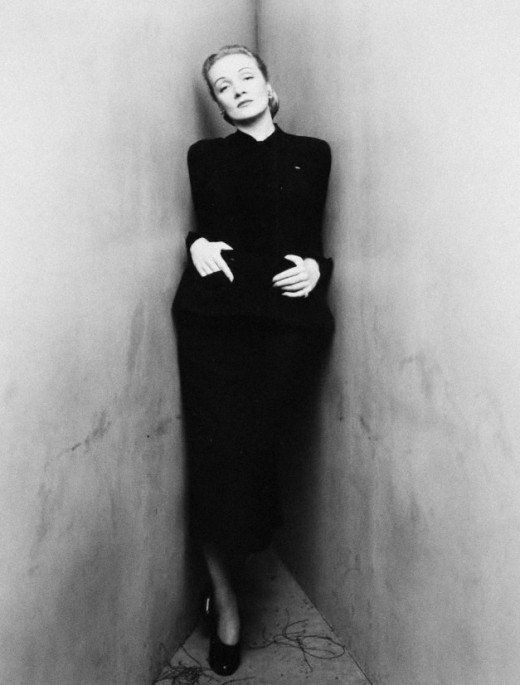 Marlene Dietrich by Irving Penn, 1948. Image via Pinterest. Georgia O’Keeffe by Irving Penn, 1948. Image via Flavourwire. Martha Graham, 1948 by Irving Penn. Image via Flavourwire. 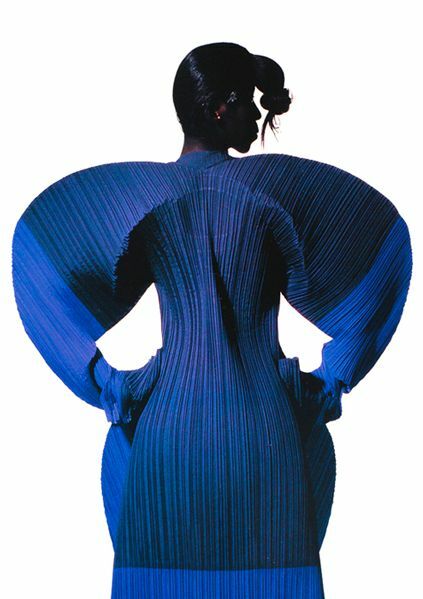 Issey Miyake dress by Irving Penn, 1991. Image via Pinterest. 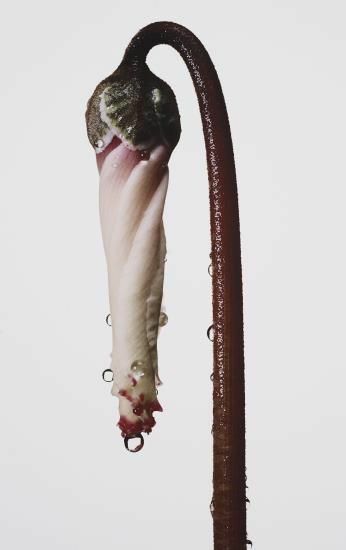 Irving Penn, Persian Violet Cyclamen. Image via Pinterest. He was born on June 16th, 1917 in New Jersey, USA. His parents were Russian Jewish immigrants, Harry Penn and Sonia Greenberg. He had a younger brother called Arthur Penn who went on to become a successful film director and producer. In 1934 Penn began studying at the Philadelphia Museum School of Industrial Art. He learned painting, drawing, graphic design and “industrial arts”, which included photography. 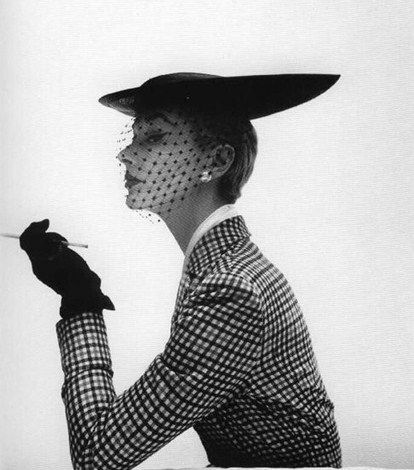 Like Lillian Bassman, he studied under Alexey Brodovich, who was also the art director at Harper’s Bazaar, and Brodovich also secured him a position as an intern at the magazine. Whilst still a student, Penn worked at the magazine for two years and had several illustrations published there. Primarily focussing on painting, Penn left the School of Industrial Arts in 1938 considering himself a fledgling painter. After two years of freelance work in fashion illustrations and graphic design, Penn took over Brodovich’s job as the Art Director for Saks Fifth Avenue. He stayed there for a year. Disillusioned with the advertising world and wishing to pursue his true calling, he then dropped the job and travelled through Southern America to Mexico, taking photos along the way and setting up a studio just outside of Mexico City. He had always been inspired by the folk art of the region. However, after a year he realised that he would never be a great painter, and so he went back to America. He did get the opportunity to experiment with his photographic style along the way, and came back with a suitcase full of negatives in the style of the Surrealists, street photography, photojournalism and social documentary. On his return to New York, the senior artistic editor of American Vogue Alexander Liberman offered him a position designing and supervising the covers, which he gladly took up. However, his ideas were too radical for the team and they mutinied against his vision. Liberman thought his proposals interesting though, and allowed Penn to set up and personally photograph one series himself. The result, a still life with a brown handbag, huge topaz ring and most importantly, no human model at all became the cover for Vogue October 1943. When WW2 broke out Irving Penn was offered a job as a war artist-photographer by the Office of War Information in London but took a job as an ambulance driver in 1944 instead. He didn’t leave his camera behind, however, and sent his photographs of the situations he found himself in to Vogue. The magazine accepted him back after his return from the war in 1945 and he worked for them as a photographer for the rest of his life. He also worked for other magazines, and branched out into advertising too. In 1949 Vogue flew him to Paris to experience the Haute Couture shows for himself. In 1947 he was assigned to photograph the Swedish model Lisa Fonssagrives and they were married in 1950. Two years later they had a son, Tom Penn, who later became a designer. In 1953 Penn set up his own New York studio, which he used for advertising and art shoots. Although he was by then highly respected in both the fashion and art worlds separately, there was no overlap between the two and while abstract and other forms of modern art had begun to be foregrounded, a ferocious debate had sprung up about what Art was (it continues today) and photographers argued that their own image making was just as valid. By the 1960s Penn was already keen to preserve his own artistic legacy and had begun reprinting a library of his own works using the latest technology for longevity, in order to preserve his images for posterity. Conversely, his rediscovery and revival of the 19thcentury Platinum-Palladium process, which lent rich depth to photographs helped late-20th-century observers accept photography as an art form. In the studio, as in life, Penn was described as quiet and courteous. However, underneath that his resolve for a good photograph was ruthless. His studio was bare and clean, but his technique of creating an artificial backdrop for his subjects entirely divorced them from any comfortable surroundings and forced them into a corner – often literally, as in his “Corner” series. Some sitters found the experience a liberating one, some came out fighting. It is “a means of closing people in. Some people felt secure in this spot, some felt trapped. Their reaction made them quickly available to the camera.” He has said about the series. After that, he settled on the plain canvas background in front of which sitters were posed. He used this in situations around the world, replacing bustling market scenes with his own pop up studio complete with strong lights and this background, inviting passers by in. This is in complete contrast to that strange movement he originated in which haughty models dressed in the latest couture are shipped out to exotic destinations, and looking entirely out of place, pose alongside bemused cattle herders on a dusty plain or picturesquely wrinkled locals . He said this idea came from being an office bound junior trapped under artificial light, wishing he could be lifted from the situation to somewhere far more interesting himself. In the end, he did travel extensively. Irving Penn worked up until the end of his life. His last photo credit for Vogue was in August 2009. He died in October 2009, at the age of 92.